Nyfoam 85 is a special bitumen product with excellent, predictable foaming properties. 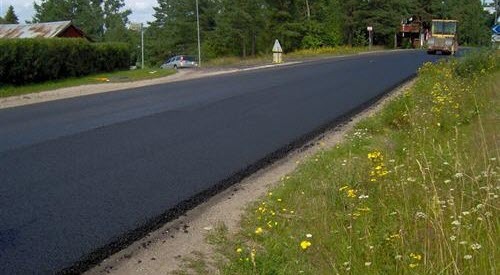 It is produced to comply with EN 12591 Paving Grade Bitumen and the Nynas Sales Specification. Use of foamed bitumen – as part of the NCC Green Asphalt® concept – lowered the asphalt production temperature from 160°C to 120°C. Bitumen foam is formed by injecting water and air under pressure into hot bitumen. The expansion of the water in the bitumen results in a rapid decrease in viscosity while increasing the effective volume of the bitumen. Foamed bitumen is ideally suited when using recycled material. The binder chosen was Nyfoam 85, a bitumen from Nynas' 'Extra' range, which has been especially engineered for use in foaming applications. Around 1100t of asphalt was produced, containing 18% of recycled asphalt planings. The NCC Green Asphalt® concept has been developed at the NCC Road laboratory in Umea in cooperation with Nynas. The development started in 2003 and the concept is being with increasing frequency in this part of Sweden. Investments are being made at several asphalt plants so that they can foam bitumen and produce Green Asphalt. The Swedish road administration is very supportive of the fact that the technique has less impact on the environment due to the lower production temperature (and hence energy use, with fewer emissions). The concept can also be used for highly trafficked roads in place of conventional hot mix asphalt. The lower production temperature reduces over time ageing of the bitumen, which increases the lifespan of a pavement. With foamed bitumen, it is also possible to use large amounts of recycled material without reducing the quality of the product. The technique leads to thicker binder layers on the aggregate and a more homogeneous mix where no separations can be seen. During development of this technique, the aim was to come up with a paving material with equal or better characteristics to conventional asphalt. Test roads surfaced using this technique have shown that the Indirect Tensile Strength Ratio and void content are equal to or better than that for conventional hot mix. An added benefit of mixing and laying asphalt at a lower temperature is a large reduction in smoke compared to conventional hot mix. This, and the reduced temperature of producing asphalt, has a substantial benefit on the working environment. There are other significant environmental benefits with using this technique. Lowering the production temperature to 120˚C reduces the energy consumed by about 20%. This means that between two and 2.5 litres of fuel per tonne are saved during production of the asphalt mix. This reduction in fuel consumption cuts carbon dioxide emissions by around 30% and nitrogen dioxide emissions by about 70%. Emissions of sulphur dioxide and carbon monoxide are also reduced. Download this information on how Nyfoam 85 was used at Årsunda, Sweden, as pdf.